My earliest memory of Alan is from the brief time our family lived in Roseville in a little two bedroom house. I told Alan the other day how I would wake up in the morning and go over to his crib to see his happy little face, eyes peering out waiting for Mom to appear. Two years before I had learned not to pick up the baby – wanting to be a helpful older sister, I horrified Mom when I brought Darleen to her, awake from her nap, holding her by her neck. One day while researching family in library films of old Macomb Daily’s, a familiar name caught my eye – the article described how the Hawk Patrol of Boy Scout Troop 202 was named the winner in the Macomb District First Aid-O-Ree, led by team captain, Alan Jeske, which I copied and sent to Alan. A Christmas present Alan gave me several decades ago has been continuously displayed wherever I resided – an old world miniature globe, which proved to be a harbinger of Alan’s sight-seeing days. Winding down the bending slope of North River Rd. for Sunday outings on Grandpa Schulte’s boat were treasured times in our childhood. In the cool of the evenings you could hear us all crooning old tunes (not exactly a barbershop quartet) such as: “Cruising down the river on a Sunday afternoon” or one perfect for Alan and his future wife “I’ll be loving you – always.” On those days Alan’s love of being out on the water was born. He later owned his own boats and a beautiful home on the water. Vacation destinations were to sunny tropical places. North River Rd. 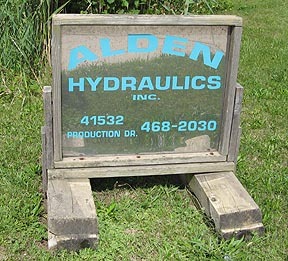 also leads to the shop Alan and his good friend, Denny, co-founded and owned, Alden Hydraulics. We have always been so proud of Alan and glad for his success. At the time Mom and Alan were at my daughter Jill’s high school graduation party in 1994, they both unknowingly carried a pernicious secret that would later claim their lives. Mom has been gone ten and a half years now. In June 2004 Alan and I could have just been a brother and sister chatting about our daughters, whether or not the NHL would be out for the upcoming season, recent trips Alan and Sandy had taken – except we were in the waiting room at Karmanos for Alan’s doctor appointment to hear the report of his latest results, which were then still good. When Alan was diagnosed with kidney cancer in 2001, a man just 46 years old, it was a devastating blow, especially since initial tests showed his was so advanced. There were tears in my brother’s eyes when the prognosis given. We wouldn’t know the exact extent until after his, hopefully, life-saving surgery, if he even had a year left. Learning the cancer had already spread to his lymphatic system, it meant options were very limited, but Alan, with his determination to live, opted to try the best treatment we could find for his circumstance. He endured four and a half years of frequent doctor visits, biopsies, scannings, multiple trips to other states, additional treatments, pneumonia, increasing pain – until nothing worked. Then came the debilitating final weeks, with Sandy his constant companion. Alan became a hospice patient this September, but continued to venture out until after Stephanie’s wedding. He couldn’t have had a more comforting place to be than his bedroom with its large bay window looking out over the canal, his beloved dogs, Teddy and Max, bounding about or by his side and the love of his life, Sandy, to provide such tender care. He told me years before they married that Sandy was the only one he ever wanted. It is fitting that Alan spent his last days and will now rest in peace near the water that brought him so much enjoyment over the years. I suspect there was always at the back of his mind the fear he did not have as much time left as most of us do. 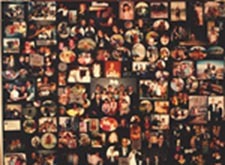 Alan packed a lifetime of living into his last years of life. On good days he still went in to his shop until earlier this year, where nephew, Bryan, carries on. He was especially delighted whenever Bryan’s daughter, Haley, came by the shop eager to see “Al.” He and Sandy traveled many times to seaside locales, often with friends. He got to see the Red Wings bring the Stanley Cup home to Detroit one more time, watch the Wolverines play football at U of M stadium. He attended concerts of some of his favorite musicians, The Guess Who, in August was his last. He celebrated four more Christmas’s with us, a holiday he always took great delight in, decorating his house inside and out to the hilt. He gazed on with pride as his daughter, Stephanie, married Derek, her own true love, before family and friends. Even during those difficult final days, Alan found reasons to smile with the grace of our mother, Rosie. He was so sweet, in quiet good humor through his distress, his response always “no, I’m fine.” He didn’t jump at the offer to boss Darleen and I around like we bossed him around as kids – just chuckled. 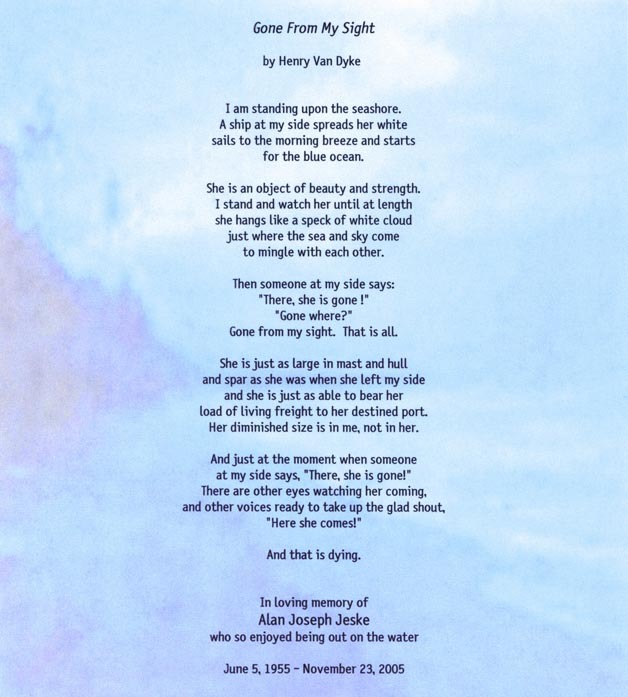 A little over five years ago our youngest brother, Robert, died suddenly. At the funeral home making arrangements Alan hugged me tightly, saying, “I just can’t believe he’s gone.” For so long throughout his ordeal Alan appeared vigorous – some trickster must have replaced him with the physically weakening man of these past three months and it is hard to believe he is gone, decades too soon. Picturing Alan sailing away, buoyed by a summer breeze, I say good-bye to my dear brother, Alan Joseph Jeske, namesake of our fun-loving grandfather, Joseph Schulte. We know that the one who raised the Lord Jesus will raise us also with Jesus and place us with you in his presence. Everything indeed is for you, so that the grace bestowed in abundance on more and more people may cause the thanksgiving of overflow for the glory of God. Therefore, we are not discouraged; rather, although our outer self is wasting away, our inner self is being renewed day by day. For this momentary light affliction is producing for us an eternal weight of glory beyond all comparison, as we look now to what is seen but to what is unseen; for what is seen is transitory, but what is unseen is eternal. The church Alan attended and where his funeral was held once had a pastor named Father James Samuel Downey who served from 1913-1935. Fr. Downey was related to Alan through the Frielink line. His sister, Rose, married William H. Frielink, brother of Frances who married Charles Lewis. William was Alan's gr-gr-uncle (Rosemarie's biological maternal side).